Super Savings on this Clearance item! For men and women, the Dermenodex Scalp Cleansing Shampoo for fine and thinning hair cleanses and removes impurities from your scalp to help promote healthy hair growth. This treatment shampoo nourishes and protects the hair and scalp, while removing the build-up of DHT. Get super savings on all Clearance items! Not only is this the lowest price possible, but you can return or exchange it too! But remember - these items are only available while supplies last. 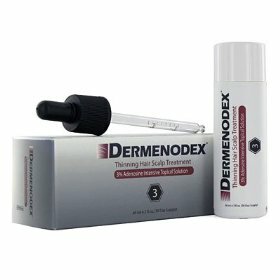 Dermenodex Scalp Cleansing Shampoo is a complete scalp wellness product. When the scalp is properly cleansed it ensures the proper environment for healthy hair to grow and develop. 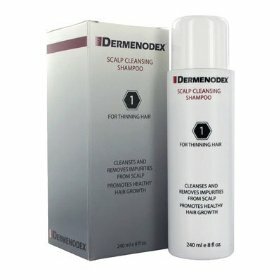 Dermenodex Scalp Cleansing Shampoo works for all hair types: Normal, Fine, Thinning, Dry or Colored hair. As you massage into your hair, the therapeutic lather promotes circulation which in turn stimulates hair follicles, creating a clean healthy scalp environment and encouraging new hair growth. On average the average person loses 90 strands of hair a day. It is very important to maintain a healthy scalp in order to avoid excessive hair loss. Dermenodex Scalp Cleansing Shampoo should be used to properly cleanse the scalp, which in turn will nourish healthy hair growth. Hair grows in phases: As the follicle grows, new hair replaces the old one that has fallen out or will be pushed out by new hair. If the scalp is not well cleaned, hydrated and nourished, the new growth will be blocked and the follicle will become forever dormant. It is very important to maintain a healthy scalp in order to avoid excessive hair loss. Dermenodex Scalp Cleansing Shampoo cleanses the scalp of dirt, oil, dry dead skin, and environmental impurities along with the build-up of DHT (Dihydrotestosterone). 3% Adenosine active ingredient stimulates follicle growth. Enhanced with bio-nutrients that nourish, moisturize and improves scalp condition.